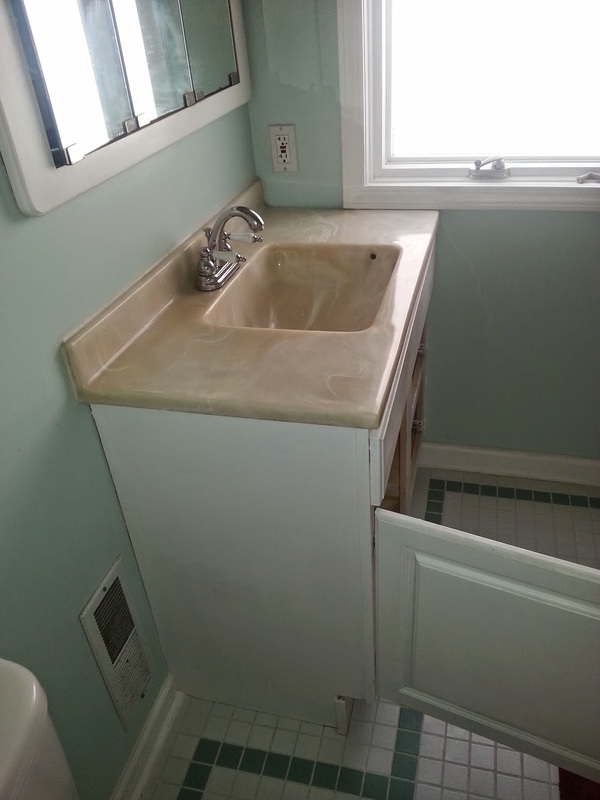 How we upgraded to a granite counter-top with under-mount sink! 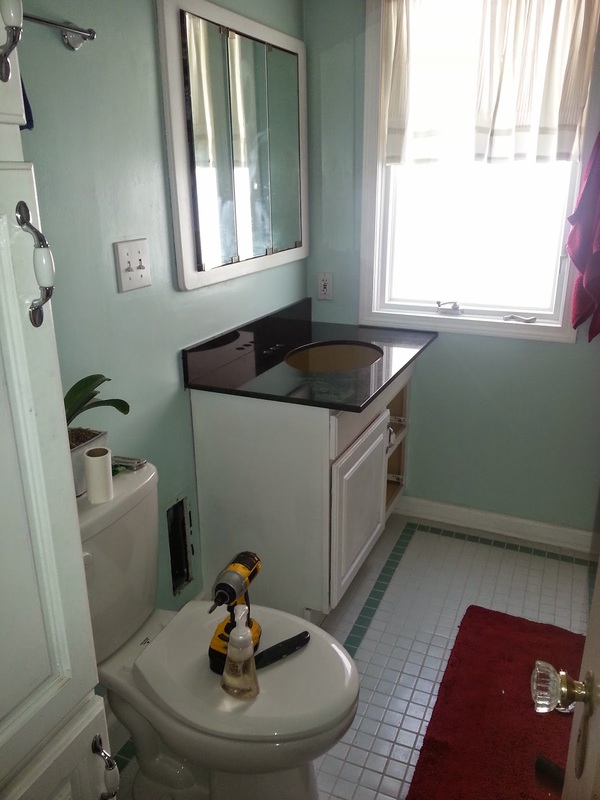 We needed to update the bathroom's builder grade counter-top and sink since this old one was outdated and ugly. There was nothing wrong with the actual vanity cabinet, so we decided to start shopping for a new counter-top and sink (not a whole vanity). We found out that already cut granite with holes for the sink and faucet at our local hardware store, Sutherlands, was comparable in price to any prefabbed contractors grade sink tops and of course was much more stylish. I mean look at those gorgeous sparkles! 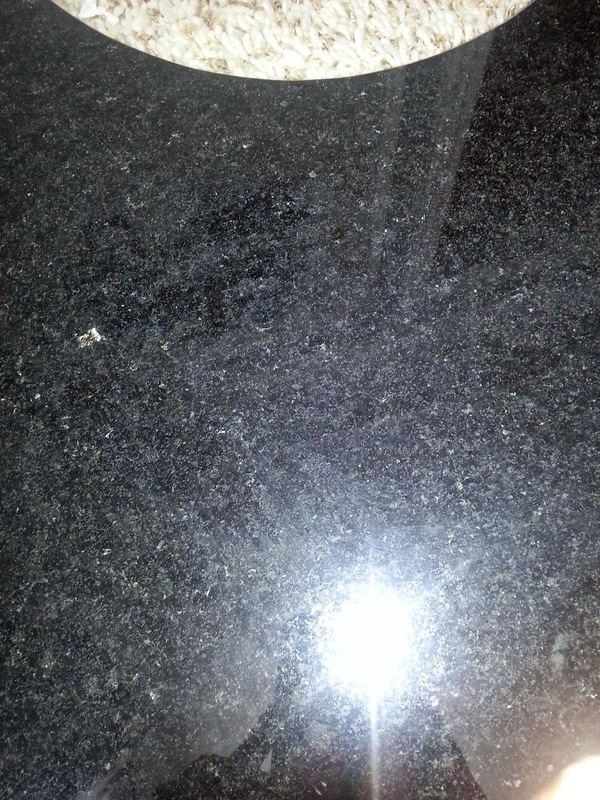 The only catch was the pre-cut granite was 22”x36” and our vanity was 19”x36”. In order to get the same granite in the smaller size we needed, the granite top would be double in price for custom - ridiculous I know! 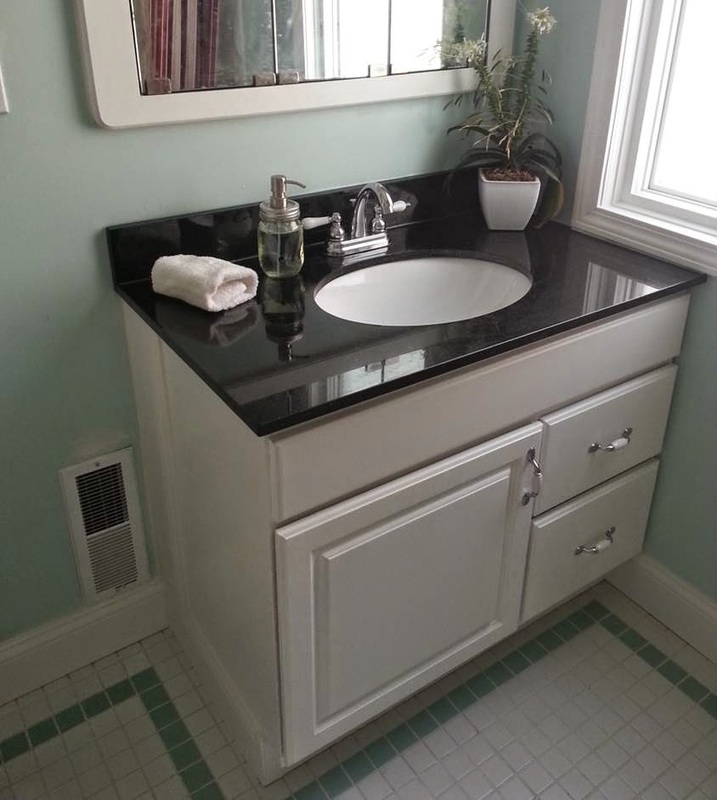 Since we did not want to double the price and we did not want to skimp on the quality of the bathroom by going with a prefabbed sink top, I suggested to move the vanity off the wall in order to fit the bigger granite counter top. This picture illustrates the 3" overhang that would originally not work. 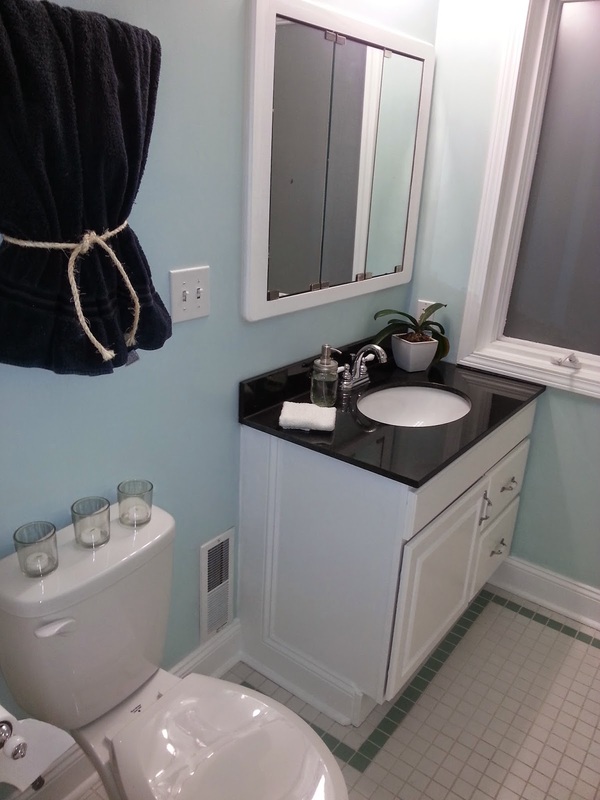 We built a pony wall behind the existing vanity and placed a trim piece along the side of the vanity so no one will ever be able to tell that the sink top was originally bigger than the vanity. 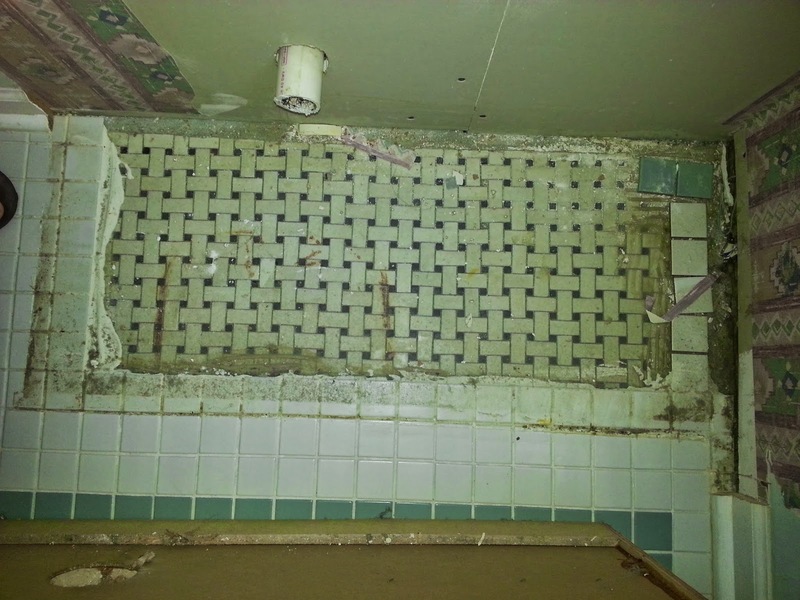 While pulling the vanity out to work behind the vanity, we discovered that a previous owner tiled over the original beautiful tile which used to be basket weave white with black tile. We are bummed and wish that tile had been originally saved. Which looked like this in it's original glory. 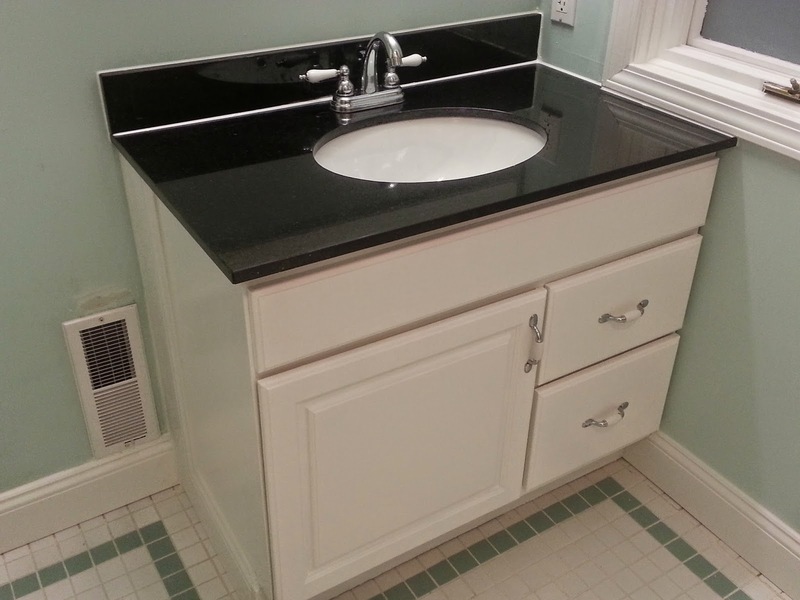 Placing the under-mount sink to the granite counter-top is a relatively easy process. 1st: We placed counter-top upside down on two saw horses. 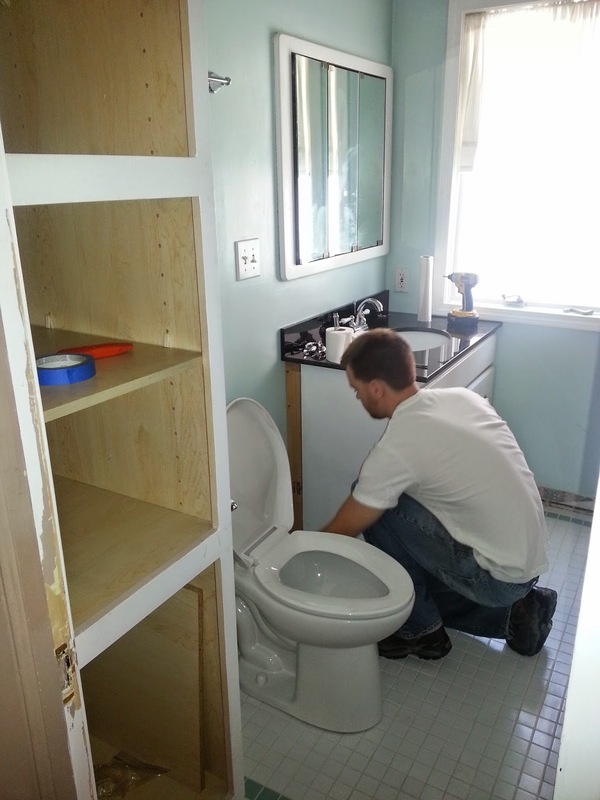 2nd: We dry-fit the sink perfectly in place by one person looking underneath for center and the other person on top positioning the sink into place. 3rd: Drew a guide with permanent marker around the location of the sink on the bottom of the granite. 4th: Placed a quarter bead of 100% Silicone Sealant along the permanent marker guide for the sink to be placed on top of. 5th: Apply weight and let the silicone adhere for 24 hours before installation onto vanity. 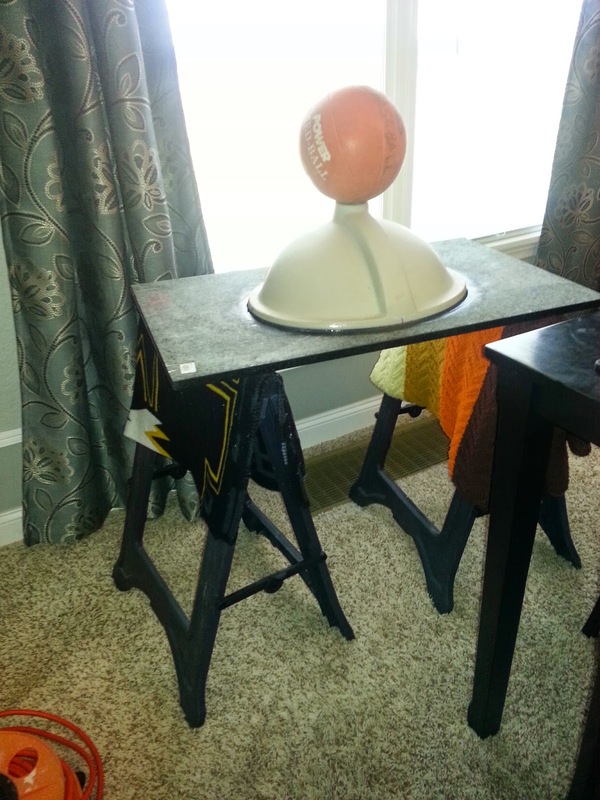 We used a medicine ball to apply some extra weight onto the sink. To sturdy the counter-top onto the vanity cabinet, we placed a dot of silicone to the four corners of the vanity cabinet before placing the counter-top in place. We inserted the faucet and hooked up all the plumbing. Finally, we applied clear caulk into all rough edges as seen in the picture below. 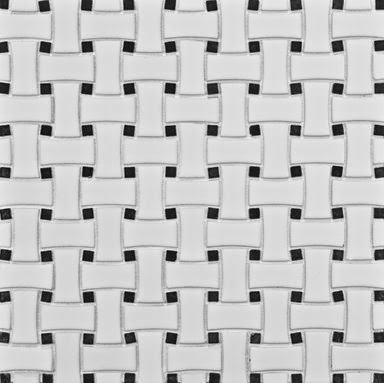 It applies white and dries clear. And in the end I love the bigger granite counter-top especially because there is way more counter space than before!